"It ain't Ogre... Til it's Ogre"
With gorgeous graphics and jokes from the start the movie tells us an amazing story full of adventure and comedy all over. It follows to show us how far a father is willing to go to save his family and wife after wishing them away only to discover that he really needs them and misses them later on. The movie starts by showing us how much Shrek misses his years before marriage and would like to be able to enjoy being chased as an ogre again. As the movie continues he learns that what he wants in his life is not to be an ogre but rather a family man. As the first jokes of the movie start appearing the viewer will have no other choice but to fall of their sofa laughing. The three dimensional art really makes the viewer feel like they are part of the movie and makes it that much more real. The sound effects and soundtrack in general provide the movie a whole new scenery that outlines the emotions felt by the characters of the movie in the different situations. We see that in perspective to Shrek’s life Fiona has changed a lot and Shrek desperately attempts to regain his love. This teaches the viewer to never give up on the love of their lives. As mentioned before the graphics will really blow your mind. They may not be ultimately realistic but they are very kid friendly and also have a very good texture that almost lets you feel the touch of the materials. The viewer will see in the story how friendship prevails throughout the most dangerous and misfortunate times. DreamWorks animation really outdid themselves with this movie by not only stretching new lines to the world of imagination but also by showing us a great story in which an ogre is not only the main character but also a worried husband and a beloved father. Donkey, Shrek’s best friend, provides constant comic reliefs throughout the entire film. This truly is a film for the entire family as it not only hides its adult content jokes within the child ones, but it also allows the family to associate themselves with a few of the characters in the movie. 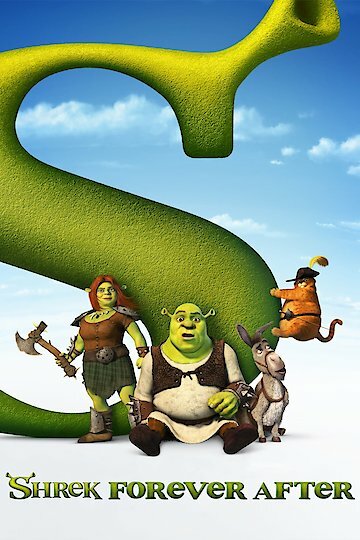 Compared to many other comedies this movie also offers a strong story following the drama of Shrek’s life. If what you want is hours of laughter make sure to watch this movie. Shrek Forever After is currently available to watch and stream, buy on demand at Amazon, Vudu, Google Play, FandangoNow, iTunes, YouTube VOD online.